The British Modern Karate Association teaches a modern style of Karate that blends traditional Karate together with Kickboxing and Muay Thai techniques to give a very comprehensive and effective martial art. Our style of Karate is a very efficient way of developing confidence, fitness, strength, flexibility, self defence and you may also be a champion of the future. 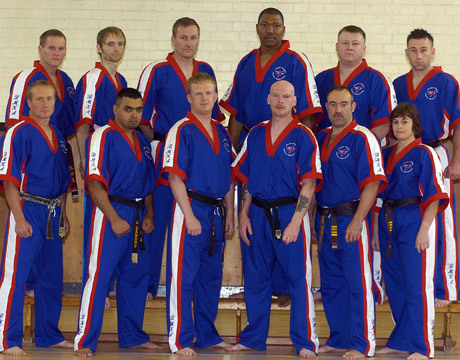 The association was founded in 2007 by Chief Instructor Ray Hoffman 6th dan black belt and former WKA World super-heavyweight kickboxing champion, along with Senior Instructors Brian Aston 4th dan black belt and former English, 2 x British, 2 x Commonwealth and World super middleweight kickboxing champion. All our Instructors are fully trained Black Belts, CRB certified, first aid trained and also trained via sports coach uk to meet safeguarding, equality and diversity legislation. All clubs offer a one month no obligation trial. Suitable for males and females of all ages from 7 years and older.